Finally! I have finished this journal page. I posted about it on Monday/Tuesday for Earth Day at Diana Evans 10 Minute Warm Up. It started off as purely watercolour but as I went on, I more or less, used whatever I could lay my hands on. 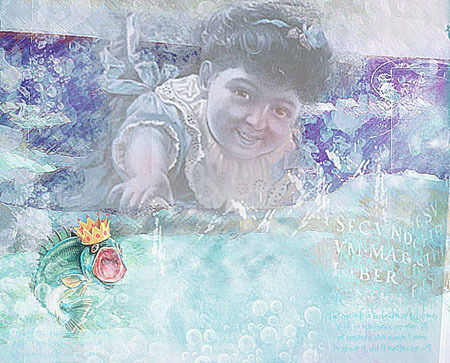 I will also link it to Julie Balzer's Art JournaL Every Day. I have been doing a lot of digital work this week due to my shoulder (thanks for the kind comments last week). I had a scan this week and apparently the tendons have come away from the rotor cuff, the upshot is that I need an operation to fix it. Meanwhile I am to restrict the use of my arm. Computer work is good because I don’t have to move it much. I can manage to do small works in my journal, so all is good. The creative juices won’t be stopped! The lace curtain because I cannot help thinking how we woman tend to hide behind things, we reveal but don’t reveal. I have been getting into vintage photographs a lot lately, maybe because of the book project I am doing for my family. I was going to use family photographs, but when my friend Shelly said her family would get upset if she used her family photos, it made me stop and think. So I will use vintage free copyright photos from the net, however I have changed them so drastically that they might not be recognizable from the original. I will try and use one of my grandmother’s from when she was 17. But, I will ask around the family first. I am not too sure about this one, may be add a quote, but the fullness of time will reveal. I like the pose as you can image a story behind, her first dance, honeymoon? This one talks to me of a young woman waiting for her beau, peeping out from behind the curtain with anticipation. This last one has a cast of sadness, a child peeping through from the outside, envious of what she sees inside. It is a bit biographical for me, as a child I was always the outsider, looking at other families wishing I had a family like theirs. 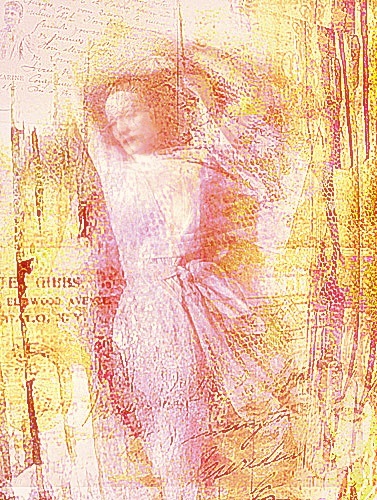 For the images I used Photoshop and had layers of photos, original art work for textures and of course the paintbrush tool to create colour etc. etc. 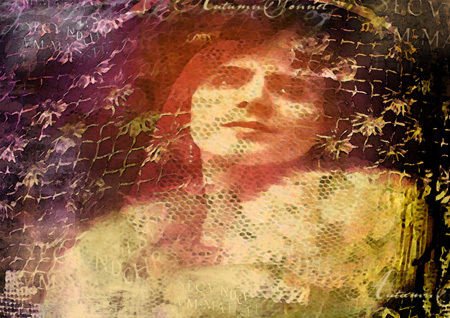 For a bit of fun I created this from some vintage art from Freubelsl Freebies. The sea I painted in Painter with some embellishments from some free brushes I down loaded from Annika von Holdt. I feel it needs a quote and all I could think of is “Who is the monster!” That could be because I have become so use to having words on my journal pages. What do you think does it need words? Have a happy Paint Party Friday and a creative week. the whole post is AMAZING dear Sharon.. I love all about it! Have a good weekend Sharon! Fantastic digital art especially the lacey one. I like your painting for Earth Day too. Hope you are better soon. You really captured the feeling of joy in that first piece, with the free flowing strokes and cheerful color scheme. Hope you feel better. Blessings and happy PPF! These look amazing! You're very good with digital work. Hope your shoulder will be better soon! lovely work Sharon. I made your Anzac cookies by the way, they are delicious! Lovely Joy - I hoped creating it helped your healing. Beautiful post, loved reading about you and your art.HPPF! i wish you the best with the surgery on your arm! wonderful that you can create even with that going on. each of these pieces are so beautiful. i love your them, very much. This post shows emotions and realities of life in pictures and words. I think you chose a deep and wise title for your book. Sorry to hear you'll need an operation to fix your shoulder but glad to see it isn't stopping you from creating! I like the theme of vintage photos behind the lace curtain. I think it's a good idea to use anonymous photos as they have any number of stories behind them and your creativity will know no bounds! Love your palette of cool colors in your first!! Love your digital stuff. It is soooo fun to play with the layers and all that can be done with photos in photo shop. I used to spend hours at it. It is always such a great feeling to actually finish something that has been a challenge or taken a long time to get to the end. I think your journal page is lovely. Yay Sharon..I love your ' joy to the world"..so magical and freeing and inspiring! 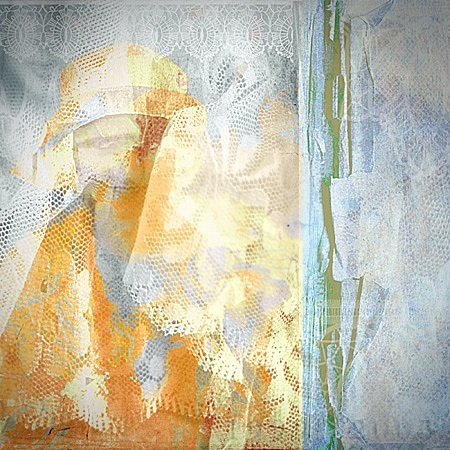 I also am super drawn to your veiled women..I really relate to these pieces and this type of energy and expression..there is so much depth and beauty and spirit in all of these stunning works..very dream-like..they invoke many metaphors and poetic thoughts..and soulful ponderings for me. I have often struggled with needing to stay hidden and yet knowing I need to push myself out to be revealed..so these touch my soul in a profound way..and feel healing! Wow..how exciting to be co creating with your photographer friend..wonderful!Best wishes to you both! Thank you for such a fantastical post of artistic-wonderment today! Oh my goodness, Sharon--I love everything on this post but your "Joy to the World" just makes me happy looking at it--I can see this as a very large canvas hung above my living room sofa--I am absolutely loving this! All your paintings are amazing, dear Sharon! Each of them tells her own Story. I so love your "joy to the world" page but wow- your digital projects are equally fantastic-so much great art!! Quite a collection of beautiful art. 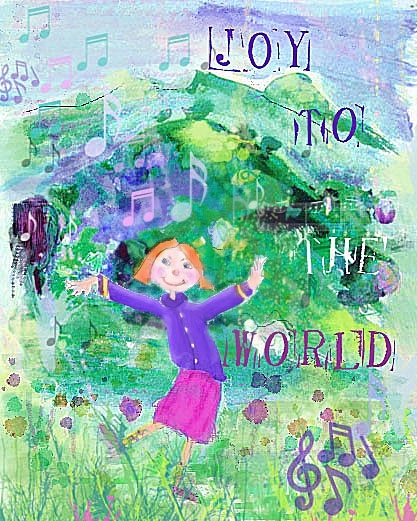 I absolutely love " Joy to the World", It reminds me of : "The Sound of Music "...gorgeous colours and composition. And your veiled images are intriguing , they all give questionable thoughts to the viewer.I like when an art piece has this gift,all of yours do. Sharon, I see you have made good use of the Annika von Holdt brushes. Your digital works are super, full of vibrancy and even a bit of mystery. I see nothing wrong with using ancestors' photos if they are not done in a manner that is demeaning. I use my grandmother and some of her relatives of that generation often and have never had a complaint. In fact my family seems to like my using them. I also love your Joy to the World. Full of life and beauty. I agree with Faye. And your digital works are very arresting and so full of longing, emotion, and even a bit of melancholy in some. I love your first image - so free and happy! I had rotator cuff surgery in 2009. It was a difficult recovery, but now I have full use of my arm and it actually feels better than the other one! Happy PPF and thank you for your kind words on my blog! Wow, i love your joy to the world sharon,is so amazing and wonderful,but your digital work is to amazing, i love it all about it!!! So sorry about your shoulder. Thankfully you're digital savvy! These are wonderful love the Joy to the world! 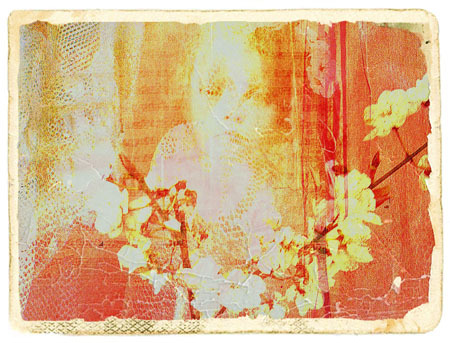 I love the idea of using vintage photos of family in your artwork. It helps those who are gone to live on... keeps their spirit alive!! I think you should do what works for you on the photo front and the words on your pieces...they are lovely either way...you have such a spectacular style that I'd hate to see anyone or thing mess with!! I am not much of a technology person, so I really admire the ability to create art work in photoshop. great work! good luck with the shoulder! Each one is so very different. Like them all actually.Happy PPF. i'm sorry to hear about your upcoming surgery, and will pray for a speedy recovery. Glad you can still create art, as your pieces are wonderful this week, so soft and pretty! You did quite some magic here! Your pictures are fantastic - I especially like the one where you clearly see the lace. Beautiful. enjoyed the series here sharon. lovely digital works. gives off a warm glow. Hope you get well soon!